How Much Would It Cost to Make It to Sunday’s Game? On the left, the banner on the night it was raised. On the right, the banner as photographed last night. When we first noticed this, we began to imagine all sorts of crazy scenarios for what might have happened to it. Did an eccentric billionaire purchase it to use as the world's coolest tablecloth? Was Brian Leetch using it to protect his motorcycle from the elements? Chopped up and inserted into hockey cards? Serving as a window shade in the Blueshirt Bulletin offices? Oh, the possibilities! 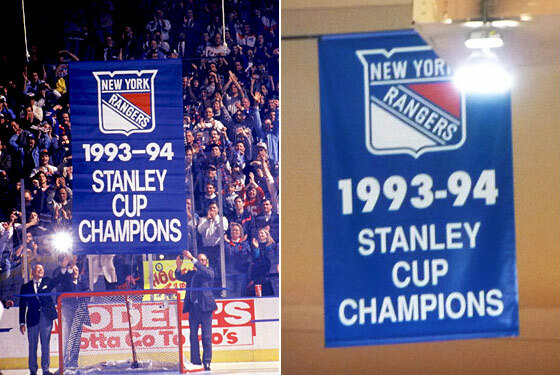 We contacted the Rangers to find out what became of the original banner, and were told at first that they'd look into it. But when we didn't get an immediate answer — which is really pretty understandable; we imagine they don't field a lot of questions about fifteen-year old banners — we began to wonder if perhaps a conspiracy was afoot. Did a bunch of Devils fans sneak into the Garden late one night and steal it in a college rivalry–style prank? What were they hiding?!? But then, after more persistence on our part than the topic probably deserves, an answer: Some of the Garden banners had started to tear, and were replaced in 2009. The original banner? The one being raised in the video below? Now in storage at the Garden. Mystery solved. You may carry on with your day.